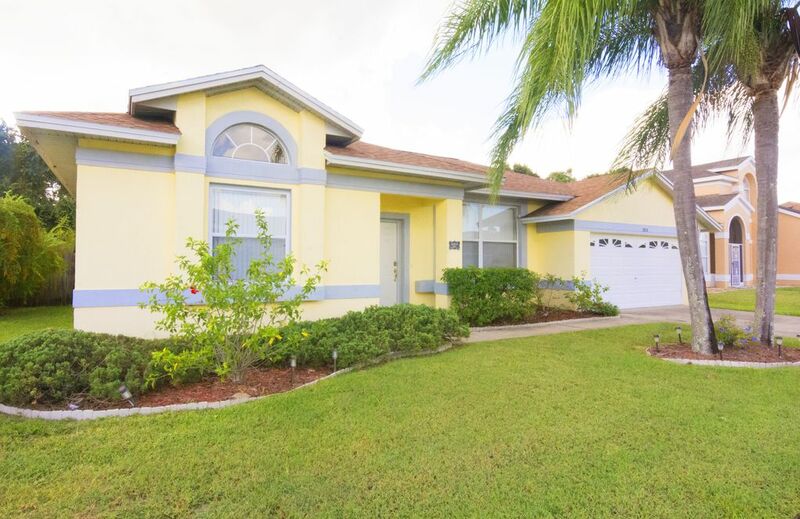 This beautiful single storey villa is in the established Lindfields development of Kissimmee, located close to Disney. The property is deceptively large and has a living area over 2,200 sq ft, not including the garage and pool area. The property has 4 large bedrooms and 2 large sitting rooms, a dining area and separate breakfast area with an en-suite master bathroom and 2 further bathrooms. There is a kitchen and laundry room, both equipped to the highest standard. Outside there is a large heated South West facing swimming pool, backing onto woodland conservation area, with pool chairs and sun loungers. Ideal for the lazy days or to relax after a day at a theme park or shopping. The pool itself is approx 30ft long and is 6 ft deep at the deep end. We have owned the villa since 2000 and have rented since then. Discounts given for last minute bookings. Phone calls: We offer free phone calls to US and Canada landlines and mobiles and to UK landlines. Free phone calls to US and Canada landlines and cell phones and to UK landlines. Amenities include, Air Conditioning throughout, Ceiling fans in each bedroom and family room, Satellite TV and VCR in both family room and master bedroom, the family room has a 47' LCD TV, wireless internet access, Nintendo Gamecube with games, Full size oven, Full size fridge/freezer with ice-making compartment, Crockery cutlery and cooking utensils, Washing machine, Tumble dryer, Iron and Ironing Board, Propane gas BBQ, Towels and linen provided, 2 cots/cribs, including bedding, and 1 highchair provided at no extra cost, Also available is a child safety screen for around the pool, We request that guests refrain from smoking inside the house, we have no objections to smoking in the pool area, We are afraid pets are not allowed.